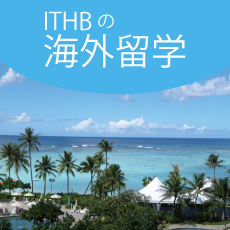 Are you enjoying your summer holidays? 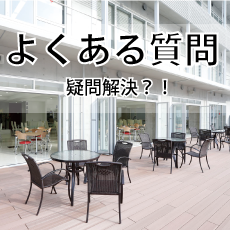 It’s hot every day, isn’t it? My students are on their summer holidays at the moment, so I’m lonely! 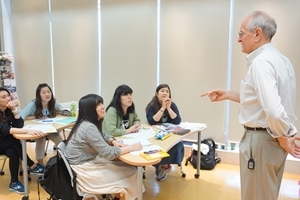 I’ll tell you about a special class we have, called Listening & Pronunciation. Jayson from America and me from England. and we also compare American and British English. It’s a lot of fun and very useful. Don’t tell Jayson, but I hope British English is the winner!!! 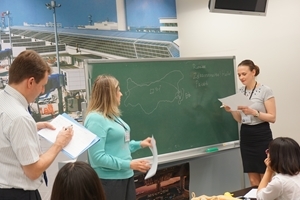 Last Saturday we had an open campus, and three graduates of my course came to visit. 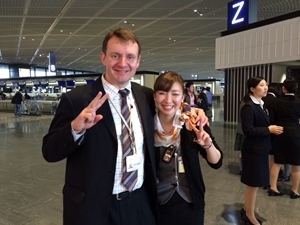 I sometimes meet two of them, but one of them lives and works at a hotel in Germany, so it was long time no see! It was really nice to see them again, and in the evening we had a surprise party with their old classmates. It was a lot of fun, and I hope to see them again soon! It’s getting hot, isn’t it? Once a week my first year students have a very special class called “WorldCommunication”. and international students from China, Mongolia, Russia, Thailand and Vietnam! 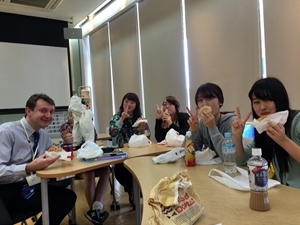 It was our final class last week so we had a party! while talking about our summer holiday plans. We all had a really nice time! Once a week my first year students have a very special class called “World Communication”. like Oshizumo, Daruma san ga koronda and Onigokko. It was really good fun and they’re becoming friends! 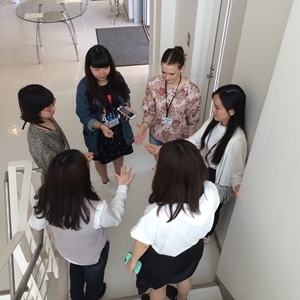 My second year students all study English and Chinese. They also study French or German once a week. I teach the German class, and last week my German friend Toni was a special guest in my class. but my students try very hard and could introduce themselves and talk about their families. 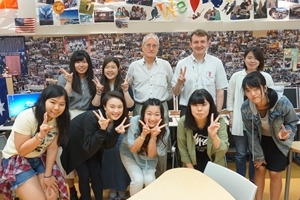 It was a lot of fun and a really good experience for them to practise with a native German speaker. Once a week my first year students have a very special class. 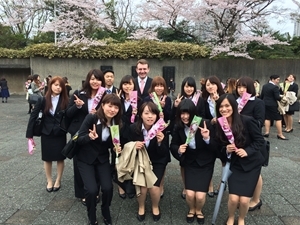 The students learn other countries’ culture, for example food, drink, sports, famous places, etc. Last week we learned greetings in different languages. 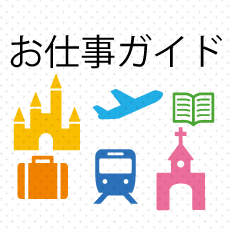 Mongolian was the most difficult for me. 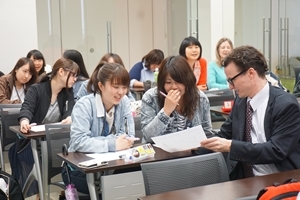 It’s a really interesting class, and my students are making a lot of international friends! On Fridays my first year students have two special classes with two teachers! One is called “Listening Pronunciation”. 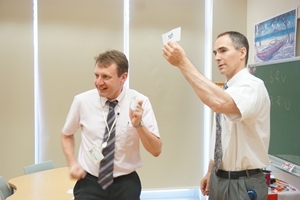 The teachers are Jayson from America and me from England. 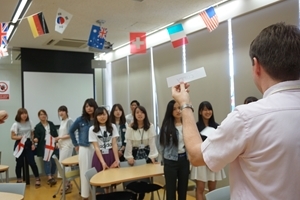 The students learn correct English pronunciation, and the differences between American and British accents. It’s very interesting and good for the students’ speaking and listening skills. 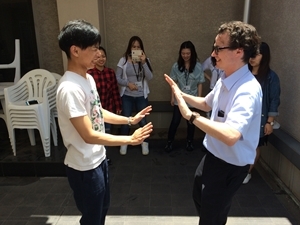 The other special class is called “English Games” with Robert from Australia and me. It’s the last class on Friday afternoons. 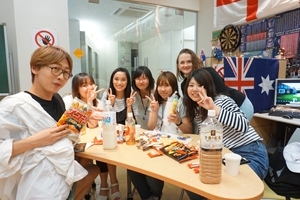 The students use a lot of English while playing games. 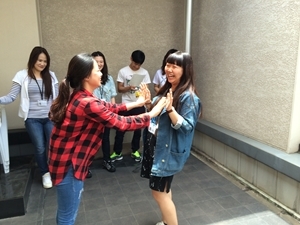 Last week we played a gestures game. It was a lot of fun!!! 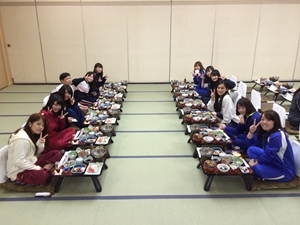 Yesterday lunchtime I took my students to my favourite restaurant in Chiba. 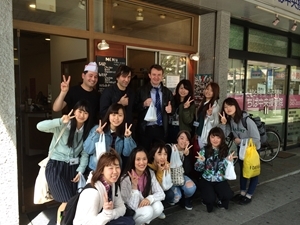 The staff are very friendly and I think they make the most delicious kebabs in all of Japan! We took the kebabs back to the English Lounge. It was a really fun lunchtime. We were very full but very happy!!! It was our college entrance ceremony on 5th April. I have twelve new students on my course, and they’re all very nice and friendly! Congratulations to them on entering college! 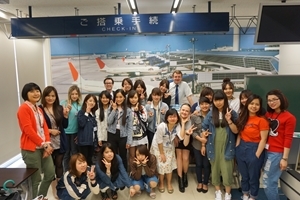 We had a two-day orientation trip to Yamanashi together with new students from the Airline and Travel departments. 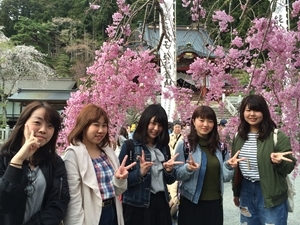 We stopped at Minobuyama and the cherry blossom was so beautiful! We had a delicious dinner and then a party with fun activities. 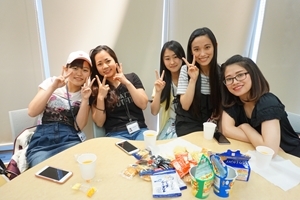 It was a lot of fun and the students could quickly make friends! Good luck to all of our new students! I’m really looking forward to teaching them for two years!! 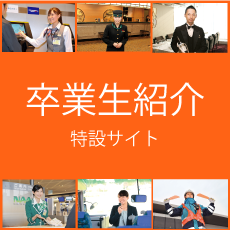 Today we had a special Narita Airport inspection event for high school students. At the airport I always meet graduates of my course. Today I met a graduate from three years ago. She works as ground staff for Vietnam Airlines. She’s working very hard and her English keeps getting better! It was so nice to see her again!